Working as a Rare Care intern has been a thrilling summer! Over the summer, Ceci and I monitored 17 different plant populations, did 10 seed collections, worked with the US Bureau of Land Management doing rare plant and weed surveys and fire severity assessments of burned areas, improved the seed vault and started almost 500 seeds of Whited’s milk-vetch (Astragalus sinuatus) for an outplanting. I’ve been able to grow so much as an ecologist, as a person and as a hiker because of the variety of tasks we got to take part in this summer, both in the field and back at the University of Washington Botanic Gardens. Here are my highlights. We drove seven hours from Seattle to attend the monitoring weekend near the Blue Mountains in Asotin County. Here we met a bunch of the volunteers who truly carry the program of Rare Care. Ceci and I were just getting started doing our first monitoring assignments. We were very impressed with the lightning-fast plant identification, the mountain goat-like hiking skills, and the pride that each volunteer took in his or her project. The monitoring weekend was planned for work, but there was plenty of time for eating, relaxing, socializing and singing in the evening. Let it be known that I sang “Big Rock Candy Mountain” with Joe Arnett (botanist and guitar player extraordinaire). In the Entiat Mountains north of Wenatchee, we did a couple of surveys for longsepal globemallow (Illiamna longisepala) and Thompson’s clover (Trifolium thompsonii). This task demanded that we literally climb up the Entiat Mountains and do six transects (four on ridges and two in gullies) that spanned 600 feet or more in elevation. Later in the day, we switched to visual surveys. Unfortunately, our surveys did not yield any plant populations, but we did receive a gorgeous view of the Entiat River Valley. 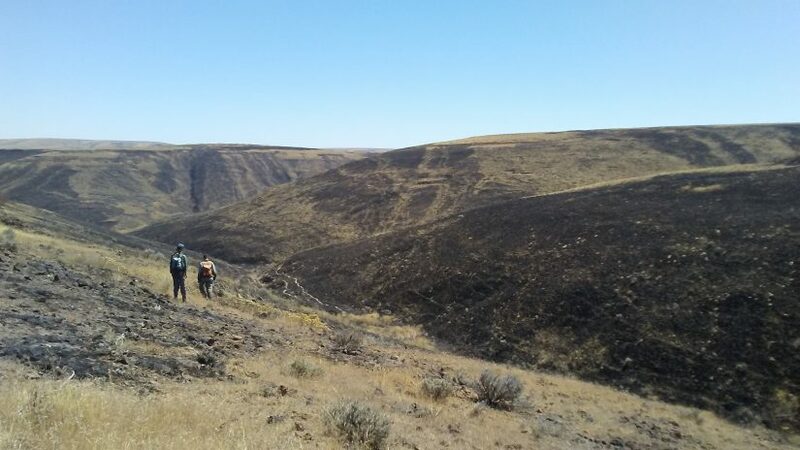 When we were around Wenatchee, we joined the conservation ecologist from the BLM office, Chris, to do a burn assessment. We thought we were just going out to do some routine surveys. Later we found out that the BLM employees refer to a day in the field with Chris as a “death march.” It was definitely steep in most places, and a little scary during one climb, but it was very enjoyable area to work. There was a perennial stream (a rare thing in Douglas County), many snowball cacti (Pediocactus nigrispinus)—some burned, but some very much unscathed—and the most beautiful and diverse lithosol community of buckwheats, cacti, sagebrush and bunchgrasses. Ceci and Chris hike through a patchy burned area. The sooty ground contrasts with a thriving lithosol community. We had some adventurous seed collections as well. While collecting longsepal globemallow (Illiamna longisepala) seeds in Douglas Canyon on the east side of the Wenatchee River, we had to wade through Illiamna plants, rose bushes, mullein, and stinging nettles my height in a steep, rocky gully. All of the other sites of Illiamna in Douglas Canyon were out in the open, very sparse, and heavily attacked by insects. Here, there was a dense collection of what we estimated to be 3,000 tall, fruiting, healthy plants. It was amazing to visit such a beautiful little area. Another time, we drove out to Smoothing Iron Ridge in Asotin County to collect Arthur’s milk-vetch (Astragalus arthurii) seeds. Unlike the other sites where we had collected, we had not been to that site earlier in the year. Finding those plants was like searching for hay in a haystack; they almost completely blended in with their surroundings. Once our eyes became better at identifying dry A. arthurii from the other three dry Astragalus species and the rest of the dried plants, it became a lot easier to gather seeds. We even went to the far reaches of Okanogan County (less than 2 miles away from Canada) to monitor glaucous gentian (Gentiana glauca). From the Iron Gate trailhead, we hiked over six miles and up a rocky slope to find our plant. We found a plant that was already fruiting that matched the characteristics of our rare plant. We mapped the population and gathered seeds while pikas chirped in the vicinity. It wasn’t until we got back to the office that, with Wendy’s input, we realized that we had actually collected seeds from Davidson’ penstemon (Penstemon davidsonii), which is abundant. Fortunately Washington Park Arboretum (part of the UW Botanic Gardens, as is Rare Care) has P. davidsonii on its future plant list, so our seeds will be planted there in an alpine exhibit. Back at the office, we researched, ordered, and installed a new shelf in the Miller Seed Vault to maximize space. We also defrosted the sides of the seed vault, which had built up a couple inches of ice in some places (using a butter knife). When we were preparing for our outplanting of Astragalus sinuatus, we stayed late gently scratching the seed coats (scarification) of almost 500 2-mm long seeds so that we could start the germination that night. It has been wonderful being able to work alongside Wendy and to learn from her. Doing all the different tasks for Rare Care has made me a much stronger ecologist, and I am very grateful to Wendy, the organization of Rare Care, and all the experienced people who trained us in the field. It was a thrilling experience to find, to collect seeds from, and to care for the natural treasures of Washington State. 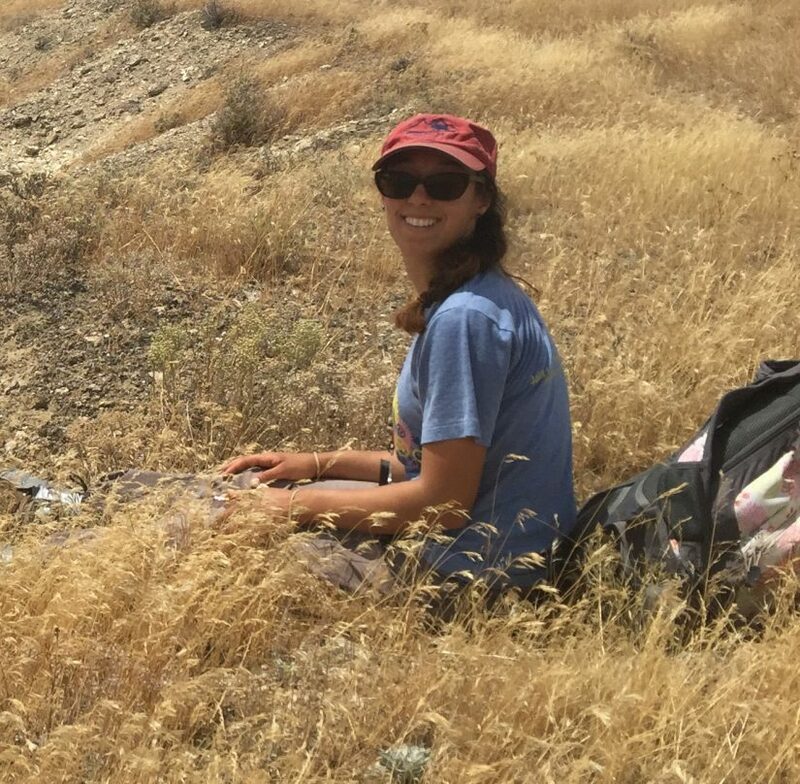 Read Ceci Henderson’s blog about her internship experience. 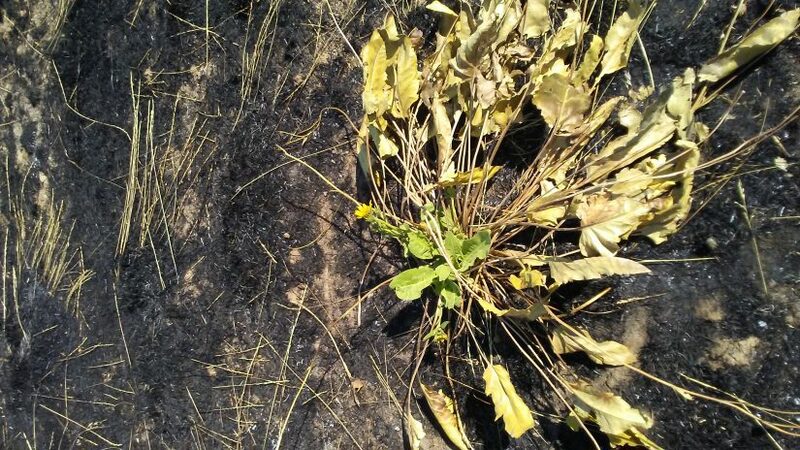 In Mccoy Canyon, Balsamorhiza careyana has resprouted and produced flowers just two weeks after a fire.